Hello from Vancouver Orthotics! Just this year we have begun using some exciting technology to help our patients to treat their foot, ankle, knee, hip, and back pain. The Orthotic Group’s GaitScan is an unprecedented and innovative tool and digital casting device that allows us to analyze the biomechanics of our patients, using over 4,000 sensors and a scan rate of 300 frames per second. What does this mean for you? With such an in-depth look into your biomechanics, we can track minor faults that are not visible to the naked eye alone. This information can give us valuable insight into your symptoms, allowing us to treat minor issues before they develop into worse conditions down the road. This technology has allowed us to treat our patients’ aches and pains with the utmost clarity and precision. If you are experiencing pain that you suspect could be caused from faulty biomechanics, don’t hesitate to call us to set up an examination! NOTE from Dr. Michael: Hi everyone! Why use 1950’s foot casting techniques in 2016? In the 1950’s foot doctors would use a plaster casted foot to create orthotics. Believe it or not some offices still use that technique today! In the 1970’s the foam box technique was used and to be honest that is a method we used at Vancouver Orthotics for many years. 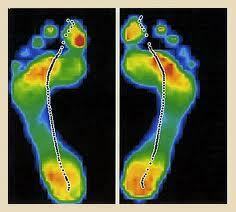 With the advent of new technology we have employed the use of the Electronic GaitScan Analysis; it’s a crafty devise which helps us maximize our understanding of the function of your feet. If you are suffering with symptoms and want a 2016 assessment, come visit our office where all new patients receive an electronic gait scan analysis as part of their foot and posture evaluations.